Waterproof covers for casts and prosthetic legs. The The Dry Pro™ systems are completely watertight keeping your casts and bandage dry. 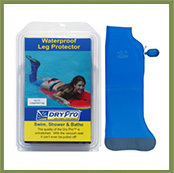 The Dry Pro™ and offer the only leg and arm cast protection in the world with the patented vacuum seal to keep you dry. It is so completely and totally waterproof, between the waterproof material and the vacuum seal, that you can even dive off a diving board or ride the ocean waves and still have your cast or bandage stay completely dry. The Dry Pro™ protectors fit snugly yet comfortably offering protection during a shower, a bath, and even an active swim. Unlike “modified garbage bag” products, the cast protection offered by these two options is unmatched, it cannot come off. You can’t even pull it off! Easy to use – simply slide on (over the cast or prosthetic). Pump out the air (with the pump supplied), push on the safety cap and off you go. When you are done, simply lift up the cuff to let air back in and slide it off. Rinse it off, wash with soap and water and it’s ready to be used again.